One of the highest compliments a manufacturer can receive is to have its products used by its peers. American DJ was recently granted such an honor when its UVLED Bar 16 light fixtures were chosen to read the UV signatures on attendee badges at the Winter NAMM Show in Anaheim, California, the largest trade show in the industry. 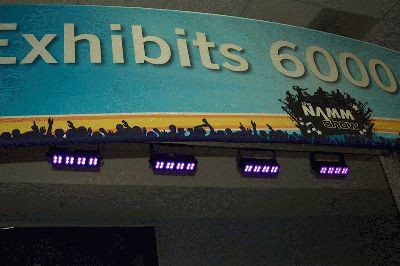 The stunningly beautiful and bright ultraviolet light generated by the UVLED Bar 16 has a multitude of club and performance uses, and its reliability both as a light effect and a UV card reader is what prompted the organizers behind NAMM to choose the UVLED Bar 16 as the show’s UV signature reader. The ultraviolet bars were installed above all entrances to read the UV signatures on the badges of show attendees, bathing the doorways in a cool indigo light and adding an extra level of security at the trade show. The 16 powerful 1-watt LEDs of the UVLED Bar 16 produce an intensely brilliant black-light that not only reads UV signatures, but can also wash over a wide area, thanks to its unique oval-shaped 10-degree vertical and 40-degree horizontal beam angle, which make it a great club light for setting a blue mood for a night on the dance floor. It’s also an ideal choice for stage performances, theatrical productions and any type of special effects lighting, including retail displays. The dual bracket of the UVLED Bar 16 adds to the unit’s versatility. The fixture can be mounted virtually anywhere in any position, including the floor, thanks to the dual bracket’s ability to become a floor stand, which allows the light to be placed on the ground for spectacular black-light uplighting and wall-washing effects. Because the UVLED Bar 16 is an LED light, it has all of the advantages of LEDs and none of the concerns of traditional UV lighting. The UVLED Bar 16 requires virtually no maintenance, with long-life LED’s rated at 50,000 hours and no moving parts. The fixture is also very energy efficient, using just 30W of power, and its low running temperature means crowds and performers can be cool while looking cool under the ultraviolet light. Plus, the UVLED Bar 16 can do things that old-school blacklights can’t, including flicker-free 0-100 percent electronic dimming and a strobe effect. And with four operational modes – DMX-512, Sound Active, Manual or Master/Slave – it offers versatility that traditional fluorescent UV lighting can only dream of. The American DJ UVLED Bar 16 is 12.5” x 2.5” x 7” and weighs 5 lbs. It includes a locking IEC power plug, a convenient on/off switch on the back and a 3-button rear-panel DMX display. The MSRP is $399.99.